When it comes time to publish an ebook, Amazon Kindle Direct Publishing (KDP) is always the first choice for authors and publishers. It is relatively easy, and the Kindle Store is the biggest ebook seller on the planet. However, while some independent authors might believe that publishing on Smashwords is not worth the extra effort, there are some very good reasons to publish on there that are worth noting. Sure, it takes a bit of work to get through the greater control of the auto-vetter and then wait for the ebook to be reviewed and approved for premium distribution, but the benefits in the long term are numerous for Smashwords authors. Once approved for Premium distribution platform, your Smashwords ebooks will be available on Barnes & Noble, Kobo, Apple, Page Foundry, Baker & Taylor, Gardners, Blio, txtr, Library Direct, Baker-Taylor, Axis360, OverDrive, Scribd, Bibliotheca CloudLibrary and Odilo. 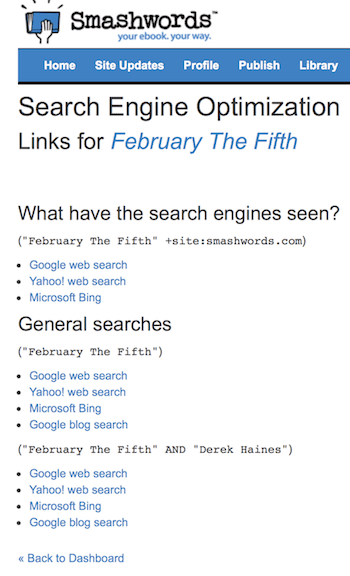 While on SEO, you will have a link on your Smashwords publisher’s dashboard for every ebook, with a list of SEO entries for each title and author. You will get your book and author name indexed on search engines by publishing your ebook on Smashwords. Again, it is more exposure which is very good book marketing for indie authors. Have you ever wanted to send a copy of your ebook to a book blogger, beta reader or reviewer? It can be a hassle for you when they ask for a special format such as mobi, epub or pdf. If you are published on Smashwords, it is very easy, because you can download copies of your Smashwords ebook in any one of nine different file formats, or book formats, at any time. You can also download a 10% preview read. It is very convenient if you want to offer a free download of your ebook on your WordPress blog or website. All you need to do is log in to your Smashwords account, go to your Dashboard, and click on your book title. This will take you to your Store page. The download links are in a box just under your book cover image. Another bonus is that even if you withdraw your ebook from sale on Smashwords so you can enrol exclusively in KDP Select, your ebook remains available for you to download. If I didn’t sell one single ebook on Smashwords, this feature alone would make book publishing there well worthwhile. Another feature I like is Coupons. If you are doing an email promotion, for instance, you can give potential buyers a discount code to use to get your ebook at a cheaper price. You can also use coupons on social media to give your ebook a kick along. The last hidden feature on your Dashboard is Affiliate Settings. I can’t say that I have used this, but why not encourage affiliate marketers to sell your ebook? With the number of affiliate marketers around, it might be worth a try. So, there you have it. Even if you don’t sell a single copy via Smashwords, there are some very useful reasons to make sure that your ebook is published there. Mark Coker and Smashwords have supported indie authors for a very long time. Smashwords is now the largest distributor of ebooks to libraries and also helps you to sell more books on ebook retailers other than Amazon. Because of this fact, it is always worth considering publishing your ebook on Smashwords. Draft2Digital (D2D) offers a very similar service to Smashwords. One big difference is that you can publish and list your ebook on Amazon. As far as pricing is concerned, there are many options. You can list your ebooks for free on all retailers apart from Amazon. You can also set different prices for different currencies and manage territorial prices. You can also set a promotional price for a set time period. Another feature is a Refer a Friend affiliate program. If you plan to publish in paperback, D2D can prepare a pdf version of your book ready to upload to any print on demand publisher. A nice bonus. More reading: Draft2Digital, Smashwords or Amazon KDP Select? Yes it may increase your Search Engine Optimisation. But if it is being sent to a load of small time publishers, what’s the point Derek? How many sales will you get from the small fry? I actually have just as many sales through Smashwords as through Amazon. Especially from Barnes & Noble. So I wouldn’t discard small sellers straight away. But overall don’t you suggest using Draft2Digital over Smashwords? Not approve, but yes, I prefer Draft2Digital because of the ease of use. For others though, Smashwords might be a better choice due to their larger list of distribution channels.